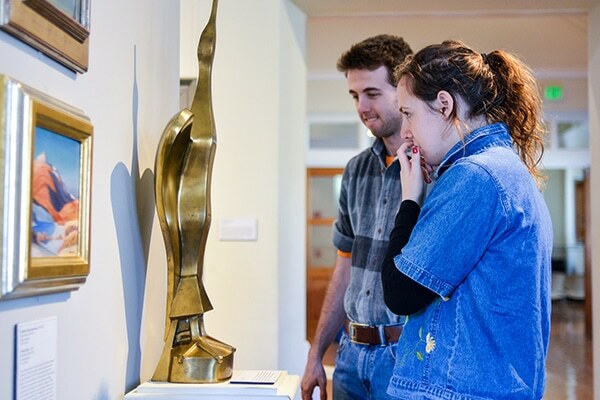 The Center Gallery, which literally connects the north (the original Church Gallery) and south (built in 1937) wings of the museum, features highlights from our fine and decorative art collections, with a focus on objects with ties to Bennington and Vermont at large. Works rotate occasionally, but you can expect to see works by artists like Ralph Earl, Raphaelle Peale, William Jennys, Francis Colburn and William Morris Hunt, loosely organized by theme and/or date. Included in this gallery is a section devoted to work from the late eighteenth and early nineteenth centuries, an alcove of work from the 1930s and 1940s, and examples of Vermont Impressionism, by artists such as Clifford Adams Bayard, Horace Brown, Arthur Gibbes Burton, and Arthur Wilder.